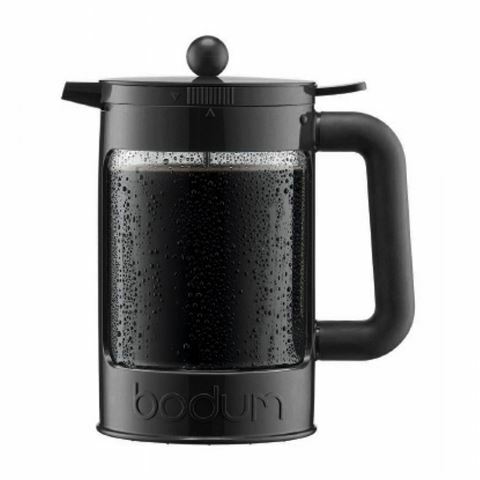 Hailing from the snow-swept land of Switzerland, Bodum combine the best in affordable European design with a whole collection of tea and coffee goods to help you get your caffeine fix. Broadening their appeal to coffee enthusiasts who can at times prefer a refreshing hit of chilled, iced coffee goodnes, Bodum have kindly and cleverly created the BEAN Ice Coffee Maker. The BEAN Ice Coffee Maker uses the same classic French brewing method to make fabulous flavoured iced coffee. Simply put your fresh ground coffee and cold water into the jug, pop the jug in the fridge overnight with the silicone lid to seal in flavour and aroma. In the morning swap the lid, push down the plunger and voila! You’ll have yourself one deliciously smooth iced coffee. Don’t dilute your flavour with ice – use The BEAN Ice Coffee Maker and entice! Handle, lid and plunger knob made from heat resistant nylon. Made of borosilicate glass, plastic, silicone and stainless steel. Includes 2 lids – one with a silicone seal to trap flavour and the other with a plunger. Control pour spout locks in flavours while preventing spillage. Recommended for use with coarse ground coffee. Includes a measuring spoon for your coffee.